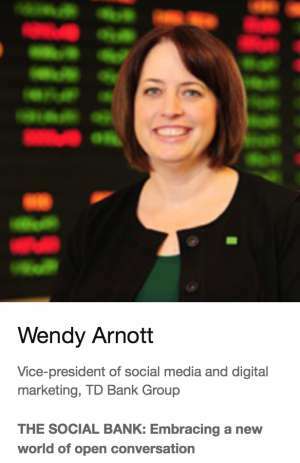 Wendy Arnott, TD Bank’s VP of Social Media and Digital Marketing was recognized by the Economist Intelligence Unit as one of the top 25 Social Business Leaders in 2014. Earlier this month, the prestigious the Economist Intelligence Unit recognised TD Bank‘s Wendy Arnott as one of the top 25 social business leaders in 2014. The financial services industry is well represented with no less than 4 social business leaders, including Wendy: Chubb‘s Jon Bidwell, Wells Fargo‘s Nathan Bricklin and Deutsche Bank‘s John Stepper. According to her LinkedIn profile, Wendy joined TD Bank at the very end of 2003. In the last ten years, Wendy has been instrumental in establishing TD Bank as one of the most engaging financial institutions in Canada, and one with the highest level of customer advocacy. Congratulations Wendy! This could only be achieved through a digital transformation programme aimed to turn the bank into a truly social business. I invite you to watch my YouTube playlist where I curated some of the best social media and social business videos involving Wendy and TD Bank. I included the recent outstandingly successful TDThanksYou campaign, the ‘bank human‘ campaign where TD Bank proudly promote their social media / social customer care team… did you know that TD Bank experimented with Google+ in the US? Twitter users, I invite you to follow Wendy (@Wendy_Arnott), TD Canada (@TD_Canada) and TD Bank US (@TDBank_US). I look forward to interviewing Wendy myself in the near future. Stay tuned on VisibleBanking.com. The rather outstanding success of TD Bank in driving customer and employee advocacy demonstrates once again that the only way to derive any significant and meaningful business value from social media is to approach social strategically and holistically. As a priority, you must make sure all the foundations (tech, processes, data/insights, content and capability) are all in place to enable you to build those trusted relationships with your banking customers, your employees and your influencers. A digital transformation programme in financial services can only succeed with the full support from your Senior Executives and under the leadership of a digitally savvy business leader. 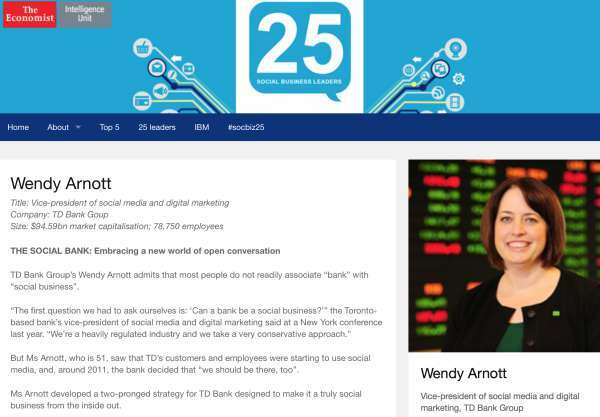 Congratulations to Wendy Arnott and TD Bank for their inclusion to the top 25 social business leaders 2014 by the Economist Intelligence Unit!